The al-Nuri mosque in Mosul’s Old City, destroyed by ISIS. Photo by Ben Irwin / Preemptive Love Coalition. The irony was not lost, standing here in one of the worst war zones of the 21st century, a hundred years to the day since World War I, one of the worst wars of the last century, came to an end. The ground beneath our feet was the last ground ISIS held in Mosul’s Old City. One year and three months since liberation, it’s a hellscape. Most of the bodies have been pulled from the rubble—and most of the Old City still is rubble. The air is thick with the dust from it. Some of the roads are passable now, others not. There are unexploded ordnances strewn throughout—it could take years to find them all. Water runs down the streets in rapid little streams you have to jump over to reach the sidewalk (where there is a sidewalk). There is no sewer system to carry it away. A sign warning of unexploded ordinances at the al-Nuri mosque in Mosul’s Old City. Photo by Ben Irwin / Preemptive Love Coalition. 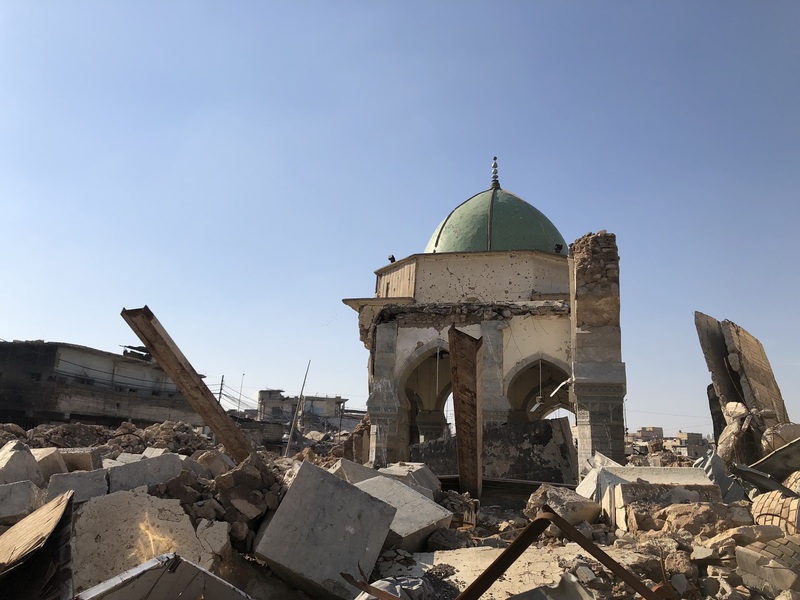 The al-Nuri mosque, one of city’s most beloved landmarks—destroyed by ISIS in a final act of spite—is now a fenced-off pile of debris. Signs in English and Arabic warn visitors to stay out because of the risk of mortars and mines, some of which you can see sticking out from the rubble. We’ve been so busy investing in war, we’ve never really tried investing in peace. When we step out of the car, the owner of a nearby teashop waves us inside. Within minutes, a small crowd has clustered around us, including an elderly man who proudly introduces himself as the mukhtar, or mayor, of this bombed-out neighborhood. Tea in Mosul’s Old City. Photo by Ben Irwin / Preemptive Love Coalition. They all have the same complaint. No one is helping to rebuild. The government is not doing enough, they say. (Our delegation included a government official who listened to every word.) Most aid groups have long since gone. They were happy to bring food and water when Mosul was a more newsworthy crisis. But those days are long since forgotten. After a few minutes, we move to a cheese and yogurt shop next door, its owner just back from prayers at a nearby mosque—or rather, what is left of it. Waad’s shop is the first business you helped start in Mosul’s Old City. Its very existence, along with the tea shop next door, feels like a small but fierce act of defiance to the devastation all around. The scene from the tea house repeats inside the tiny, darkened cheese shop. More people press inside, as Waad shows us how he manages to refrigerate his cheese without electricity. Inside Waad’s cheese and yogurt shop in Mosul’s Old City. Photo by Ben Irwin / Preemptive Love Coalition. Each person has a similar story. The government has forgotten us. The world has forgotten us. You reduced our city to rubble in order to defeat ISIS. Now what? Outside, there’s no sign of any organized rebuilding effort. Just lone individuals battling mountains of debris, armed with nothing but wheelbarrows, shovels, and maybe the odd sledgehammer. And it struck me that this is how the next war starts. People in Mosul’s Old City haven’t had a chance to dig out from the last war, and we’re already laying the groundwork for the next. One hundred years since “the war to end all war,” we still haven’t learned to break the cycle. After Germany’s surrender in 1918, the allies opted to retaliate instead of helping them recover. “The terms of peace eviscerated Germany,” according to one report. Crushing reprisals stoked hardship and discontent, which led directly to the next world war 21 years later… and tens of millions more dead. We are repeating this history in Iraq today. The war with ISIS is mostly over, yet the conditions that led to war remain. Families lack basic services. They feel forgotten. A major reason men join paramilitary groups of all stripes, from extremist groups like ISIS to the various militias who fight them (and sometimes each other), is because they have no other way to provide for their families. No one to help rebuild from the toxic rubble of war. This is the story we heard again and again in Mosul. Devastation near the al-Nuri mosque, Mosul’s Old City. Photo by Ben Irwin / Preemptive Love Coalition. Thousands of men have no way to look after their families. No one to help rebuild from the toxic rubble of war. If they had a business that earned them as little as $20 a day, it would be enough. Enough to give their families hope in the devastation. Enough to help them rebuild. Enough to erase the lure of paramilitary groups who, whatever their agenda, have a vested interest in the status quo—fighting, fighting, and more fighting. Today, one hundred years and several more wars on from the end of World War I, it can feel like peace could never work in a place like Mosul. But the truth is, peace has never been tried. We’ve been so busy investing in war, we’ve never really tried investing in peace. It wouldn’t take all that much. Every new business, every family empowered to build something for themselves from the rubble of Mosul, every man who does not join a paramilitary group because he can provide something better for his family—that is an investment in peace. It’s an investment in peace we can make today.